Home » Company News » Spooktacular Discounts! Happy Halloween, everyone! Great time has come – time of tricks, sweets and scary costumes, and of course we couldn’t let it just pass behind. At this magic time we have a decent gift for you! So, now you think about Halloween candies? No, our gift is a way better! 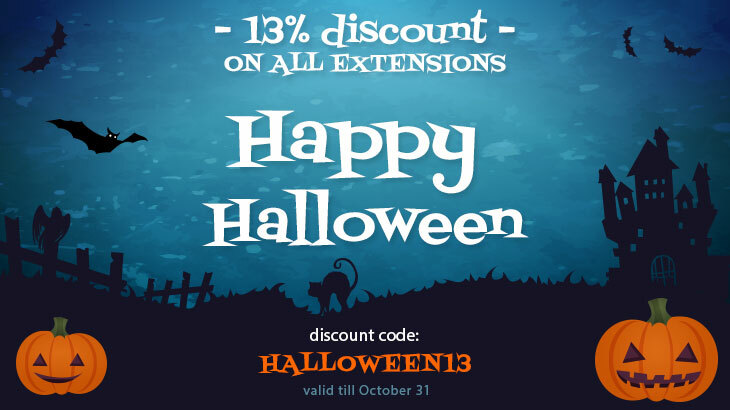 For everyone who’s not scared enough on these spooky days (and we’re sure that you’re brave enough), we’ve prepared discounts for all our extensions! Use the discount code in cart, and get 13% off for any of our extensions. Coupon is valid till October 31th. Don’t miss the chance to use our Halloween discounts!